I know we're transitioning into Autumn and everyones starting to switch to more matte products but my skin has been so dry recently (I think it's the change in weather) most matte products have been a no go for me. So today I wanted to share my favourite dewy base products. This LA Girl foundation is amazing if you want a good glow and coverage! The formula is so light, easy to blend and really looks natural on the skin. It has a solid medium coverage to. The finish is on the more dewy side which I love. It doesn't cling to any dry areas, nor does it dry my skin out. It feels comfortable all day. Even though this is a dewy foundation I don't find it oily or slippery on the skin and it lasts all day, without any issues on me. I can't believe how cheap this is because it's amazing. Good glowy powders are really hard to find. This trio from Hourglass ticks all the boxes for me though. The powders are so finely milled and melt into the skin, setting makeup perfectly. They give the skin a gorgeous natural glow to it. These are like highlighters though. They almost give the skin an airbrushed, flawless finish. Ok, so this isn't actually a dewy concealer, it has more of a satin finish. I don't really like my concealers to have a dewy finish, I find them to slippery and difficult to work with. This one from Too Faced though is perfect because it doesn't cling to dry patches and isn't drying on the skin. It has incredible full coverage. My horrendous dark circles are no match for this! It works on blemishes. It's really creamy, easy to blend and leaves the skin looking naturally flawless. My current favourite dewy primer comes in the form of this CT Filter. It's not just a primer though it can be used as a foundation or a subtle highlighter. I personally love this as a primer. It gives the skin a beautiful glow, that isn't over the top or shimmery. It has a tiny bit coverage and gives the skin blurred appearance. I really love this under matte products but it works well under dewy ones to. If you have dry skin I really recommend checking this out. Another affordable foundation that has a lovely dewy finish is this stick foundation from Makeup Revolution. This is convenient to use, just swipe and blend. It has a good medium, but build able coverage. I will say that if you have normal or oily skin you probably won't like this because it can be a little too dewy as the day progresses. But if you have dry skin this is definitely one to check out. These have been a real game changer in my makeup routine! These nifty little drops can be mixed with foundation, used as primer or only as highlighter. I love to use these as a highlighter or mixed with foundation. As a highlighter they give the skin a gorgeous reflective sheen that looks so natural! Mixed with foundation they give it a subtle dewy finish. They work really well with matte foundation to stop it exaggerating any dry areas. Another product from Iconic that has been a game changer is this setting spray. Well I say setting spray but it can be used as primer to. This spray contains shimmers that give the skin a subtle sheeny finish. But it doesn't look like wet glitter, it just gives the skin a healthy glow. It also melts powders into the skin. It's a great little product! 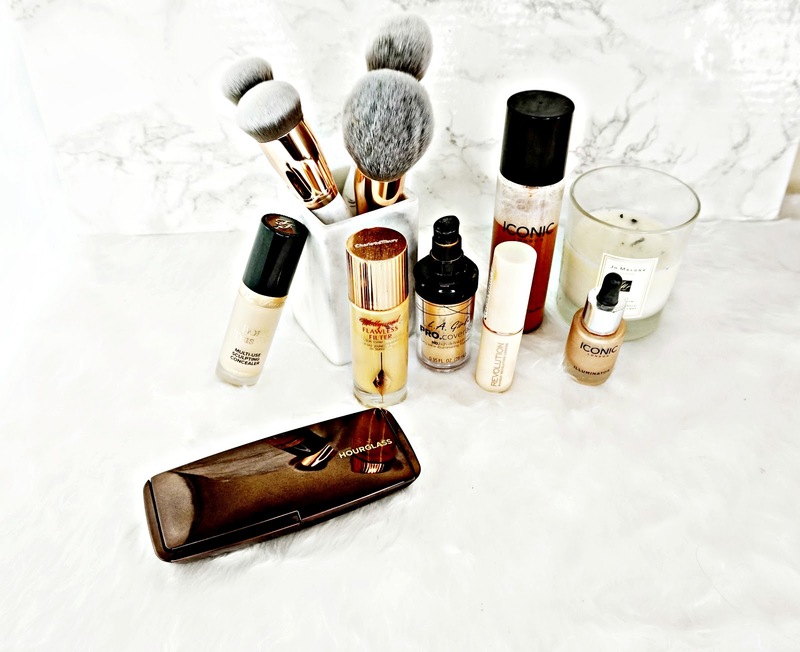 So there's a few of my favourite dewy base products.